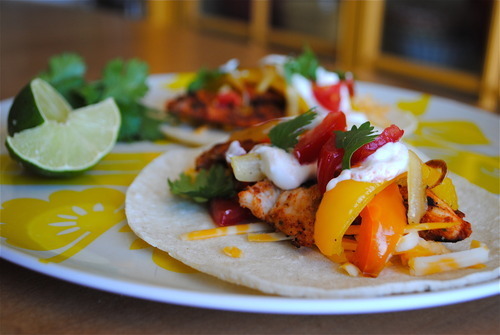 These are more of a “fajita taco” if you will. I made these for my husband for Father’s Day and he ate six of them. Combine all dry rub ingredients in a small bowl. With clean hands coat and massage dry rub into chicken strips. Set aside. Heat a large skillet over medium heat. Add a good drizzle of olive oil. When hot, add peppers and onions. Stir occasionally, allowing the vegetables to cook evenly. It will take about 10 minutes. Multi-task and grill the chicken while the vegetables are cooking. You can cook the chicken many different ways. I have a grill pan that I love to use when the propane is out (like it was on sunday :/). You could also use a skillet. Heat your pan over medium-high heat for a few minutes. You want to get the pan nice and hot to get a good sear on the meat to lock in the juices. When pan is hot, working in batches, place chicken strips in a single layer on the bottom of the pan. Cook on each side for 2 minutes. Don’t be tempted to move the meat before your two minutes is up or it will tear. The meat will cook quick, so be careful not to over do it. You don’t want jerky tacos. When chicken is cooked place a couple strips on a warm tortilla. On top of the chicken place cooked onion and peppers, sour cream, cheese, diced tomatoes, and some torn cilantro. Serve lime wedges on side for squeezing right before devouring. I'm looking forward to trying these again with the correct ingredients.